Tired of paying high prices for cleaning supplies? Worried synthetic chemicals are bad for your family. Here are thrifty natural cleaning alternatives! There is a whole slew of messes to be cleaned around the house. Each of these messes requires a unique cleaning product. But cleaning products can be expensive. They are expensive. Their synthetic components can be toxic to your family. Are you looking to switch to cleaning products that are good for the environment? Do you want to save some money? Look to these thrifty natural cleaning alternatives to better your wallet and your home. These materials are cheap and easy to get. The best part is they can combine together to make cleaning products for any purpose! So what are these thrifty natural cleaning alternatives? 1. Laundry Detergent – We all need to wash clothes at some point. Why waste your hard earned money on expensive detergents when you can wash your clothes for a few dollars? 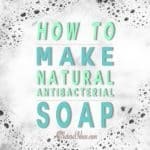 You will need one Castile bar of soap, a cup of borax, and one cup of washing soda. Grate soap bar into chips. Then, mix in the other two ingredients. When you are done place in an airtight jar. Use one or two tablespoons with a hot or warm wash.
2. Glass Cleaner – This one you can use on your car or windows. Glass gets dirty. Streaks, bugs, dirt all get stuck. Your windows become cloudy and are unappealing to look at. Mix a solution of half vinegar and half water in a spray bottle. Spray on glass and wipe with newspaper or a lint free cloth. Bam. A clean, streak free glass surface! 3. Bathroom Cleaner – We are all looking to get rid of that mold on the shower curtains. Or trying to clean up the buildup on the floors. Make the sinks usable again. Here is an easy bathroom cleaner to fight all of these dirty places. You will need: 1/4 cup of lemon juice, 1/2 cup of vinegar, 3 tablespoons of Castile liquid soap, 3 tablespoons of salt, and 1/2-3/4 cups of baking soda. Mix into a bowl and apply to a damp sponge or towel. If any scuffing occurs remove the salt from the mixture. 4. Furniture Polish – Is your furniture aging? Hardwood floors taking a beating? If so try to make your own furniture polish! Store brand polish can be pricey. You will need 1/4 cup lemon juice, a tablespoon of vinegar, and 3/4 cups of olive oil. Mix the ingredients into a jar or bowl. Then, apply to a damp cloth and rub on furniture surface. Wipe off with a dry rag towel. There are countless thrifty natural cleaning alternatives. The raw materials are cheap. The end results are just as good as store bought products. Why waste the money on synthetic products? Why would you buy something that could be toxic to your house and family? Make the switch to natural products to save your family and your wallet.